Brett Beach and Tim McCollum, co-founders of Madécasse, spent two years as Peace Corps volunteers in Madagascar. During that time, they fell in love with the country and its people. Recognizing the need of the Malagasy for stable jobs and fair wages and the connection between poverty and environmental destruction, Brett and Tim discussed possibilities for a social enterprise in the country. Madagascar presents a beautiful yet challenging place to operate a business. It has a wide range of flora and fauna, approximately 70% of which are found nowhere else on Earth and it produces coffee, vanilla, sugar, cotton, pepper, cinnamon, chili, cloves and high quality cocoa. However, it is also one of the least developed countries in the world. Seventy percent of the population is rural and 90% live on less than $2 a day. Madécasse, with its headquarters in Brooklyn, New York, partners with farmer cooperatives and a chocolate factory in Madagascar to make single-origin, tree-to-bar chocolates for sale in high-end groceries and chocolate boutiques internationally. The Madécasse model maximizes the amount of value added to the final product in Madagascar. It includes strong relationships with the cocoa farmers, partnership with a chocolate factory, sourcing ingredients and packaging from around Madagascar, and exporting the final, fully packaged products. It is through this holistic approach that Brett and Tim created a business model that offers more than four times the social and economic benefit to Madagascar when compared to the standard Fair Trade model. Madécasse competes with other specialty brands and numerous conventional brands. In order to catch consumers' attention, the founders obtained "Fair for Life" and Organic certifications. However, Madécasse is not unique in differentiating based on single origin, certified specialty chocolate. Survival depends on Madécasse ability to leverage its "4 X" impact. The case study asks students to look thoroughly at the value chain in Madagascar, understand Madécasse operations and the local impacts, and the methods used to communicate to final consumers. Students are challenged with fully comprehending the value proposition of Madécasse and how it can be aligned with and communicated to current and emerging customer needs. 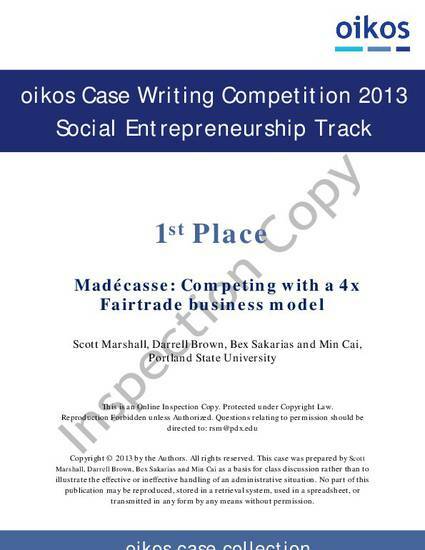 This case study was awarded 1st place in the 2013 OIKOS Global Case Writing Competition - Corporate Sustainability. Copyright 2013 by the Authors. All rights reserved. This case was prepared by Scott Marshall, Darrell Brown, Bex Sakarias and Min Cai as a basis for class discussion rather than to illustrate the effective or ineffective handling of an administrative situation. No part of this publication may be reproduced, stored in a retrieval system, used in a spreadsheet, or transmitted in any form by any means without permission. This case is accompanied by a teaching note, available to faculty only. Please send your request to pdxscholar@pdx.edu.